Eccoci qua. Ci siamo tutti: noi di DLSO, Le Cannibale, il Tunnel di Milano che ci ha ospitati fin’ora e l’artista della settimana, Olugbenga dei Metronomy. Sono combattuta tra il creare un’atmosfera da ultima puntata di Amici di M.D.F. con tanto di proiezione di video felliniano coi migliori ricordi di quest’anno e il terminare tutto a tarallucci e vino, volemose bene, coriandoli e trombette. Il concetto è questo: fa caldo, dentro al Tunnel non si può più respirare, e il sipario si chiude sulla stagione 2011/2012 del neonato concept milanese de Le Cannibale. Dietro le quinte di questo spettacolo settimanale fatto di pubblico istrionico, danze mascherate, musica scelta più della carne che ti mette da parte il macellaio di fiducia, uno staff di gente simpatica nella vita e non per mestiere. I complimenti più grandi vanno ad Albert Hofer e Marco Greco, le due menti portanti dietro il progetto, per come hanno saputo scrivere la partitura di ogni singolo strumento impiegato dall’orchestra, e al boss di DLSO (pover’uomo, neanche avete mai letto il suo nome su un articolo) Gianluigi Peccerillo, che ha dato modo a questa fruttuosa collaborazione di nascere e svilupparsi con estrema spontaneità. Ringraziamo di cuore anche tutti gli artisti, e che artisti, che durante questi nove mesi si sono resi disponibili a rispondere alle nostre interviste ironiche e indolori; ringraziamo chi ci ha regalato un mixtape perché ci vuole bene e chi si è messo di buona volontà a confezionarci una playlist su misura. Questo venerdì 25 maggio, a conclusione del percorso meravigliosamente fatto insieme, dietro il mixer del Tunnel ci sarà Olugbenga, bassista e cantante dei Metronomy, quel gruppo che ha fatto quell’album famoso, con la palma sopra, come si chiama?? Ah sì, The English Riviera. Accanto a lui Uabos, il rastone timido, Kosmi, il biondo identico a Shaggy Rogers (il padrone di Scooby-Doo, ndr) e Nemsi. Un saluto particolare va al tecnico del suono che, nonostante le avances di uomini, donne, bambini e animali, è rimasto incorruttibile fino all’ultima serata e non ha ceduto a nessuno. Ecco l’intervista al nostro ultimo ospite. Godetene fino all’ultima parola. 1.Hi man, introduce yourself to our readers. Bon giorno. 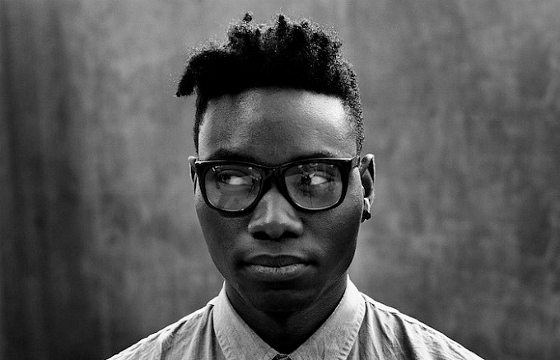 My name is Olugbenga. I’m DJ and make electronic music. A lot of the time I also play bass guitar in a band called Metronomy. 2. Would you like to remember your african roots with us? If you could bring some elements of your culture in Europe, what would you choose? I was born in Lagos (former capital city of Nigeria) and lived there on-and-off till I was 16. Despite the fact that the situation with the government was very bad while I was there (military dictatorship for the most part), I have very fond memories of my childhood there. If I could bring something from Nigeria to Europe it would of course be the food. I’m terrible at cooking Nigerian food and since I don’t live with my parents anymore, it’s something I miss. I would also say that I’d bring the music, but actually the music of Fela and highlife is already fairly well-known in Europe. 3. Is there a kind of competition or collaboration with your band mate Joseph Mount in the activity of djing? Do you like to be defined a dj or not? I’m fine with being called a DJ, although I prefer to be called a musician because that’s the one term that encompasses all the different things I do – singing, producing, playing bass guitar as well as DJing. I think I also don’t feel comfortable with that term because DJ culture is not something I’m really part of – I head out into the world to DJ and then I go back home! I don’t feel the sense of community that I think a lot of other DJs do. My interest in DJing rose at exactly the time when Joe’s interest was waning… so no competition. Plus, we have very different styles of DJing. There’s no real comparison. 4. What is the main difference between the public of your concerts and the public of your dj sets? Do you like to imagine an ideal listener of your music or the best audience is the most heterogeneous one? Really if someone wants to listen to what I’m doing musically, that’s great. When I DJ, all I want is for people to keep dancing even when the tune I’m playing isn’t immediately familiar to them. The audience can be big or small, male or female – doesn’t matter to me. I actually have a big divide between my DJ sets and the remixes and tracks I produce. When I DJ although I’m creating my own edits of songs, 99% of what I play will be other people’s music. I don’t really do concerts with my own music yet – it’s something I’m going to start experimenting with over the summer actually. 5. Do you think that Metronomy could exist without Joseph Mount? What would you do now if Gabriel Stebbing never said goodbye to the band in 2009? Metronomy is Joe Mount. It’s his band and he’s just letting the rest of us join in the music with him. I was working as a musician in London before I joined Metronomy. One way or another, I’d still be making music even if Gabriel hadn’t given up bass duties. 6. If you could compose the best contemporary electronic band with the members you prefer all over the world, who would you sign up? Please, leave James Murphy at home! That’s a tough question because so many of the electronic artists I’m into work alone. You’d need a great drummer, so I’d start with Anna Prior from Metronomy. Then I would track down a Japanese producer called Cornelius. After that we’d head to California and pick up Flying Lotus. We’d land in Nigeria and hook up with a producer and artist called Don Jazzy. 7. It’s a sunny day and you are super excited. What song are you listening to? And if it’s a rainy and boring afternoon? Don’t be ashamed of your answers, Britney and Christina are accepted too. On a sunny day, a song called “Mountainhead” by 65Daysofstatic. On a rainy day, the only choice is “It’s Raining Today” by Scott Walker. 8. During last year ”The English Riviera” has revealed that Metronomy identity is mature, smart, complex and confident without pretending to be considered a sort of ”intellectual pop”. What will be the natural evolution of your future projects? Man, honestly at this point I couldn’t say. So much of what I’ve done has been disjointed – lots of remixes and not very many of my original tunes. I’ve moved out of London (after more than 10 years!) down to Brighton. My intention is to start putting together a studio because it’s something I can afford to do here. The biggest evolution will be the move from working on headphones from a laptop in the back of a tour bus to making music in a space where you can make noise! 9. Ok Gbenga, we have finished our interview and you will be happy to know that you’re the last artist of this wonderful season of gigs organized by the crew of Le Cannibale in Milan. Weather is too hot and we need to go the swimming pool to make party. Prevail upon our followers to come back to Le Cannibale’s gigs next year and tell me the first track that comes to your mind if i say ”Dance Like Shaquille O’Neal”. Thank you so much. I think of a song called “Where Ya At?” from Shaq’s first rap album Shaq Diesel. P.s. Dopo avervi fatto consumare tutti i fazzoletti presenti in casa al pensiero che Le Cannibale molli un vuoto incolmabile nei vostri venerdì, la bella notizia: si sono solo spostati al Magnolia, non abbiate paura. Non vi lasciamo mai senza niente da fare. P.p.s. Qualcuno dica ad Olugbenga che sono una donna.